Chefs say that a copper pot is the quintessential cookware because of its superior heat conduction. But is it really worth the price tag? Until yesterday, I didn't think so. I just wasn't willing to pay the price. After all, I'm not a cook! So, when I saw these copper pots at Homegoods, I couldn't pass them up because the price was unbelievable! 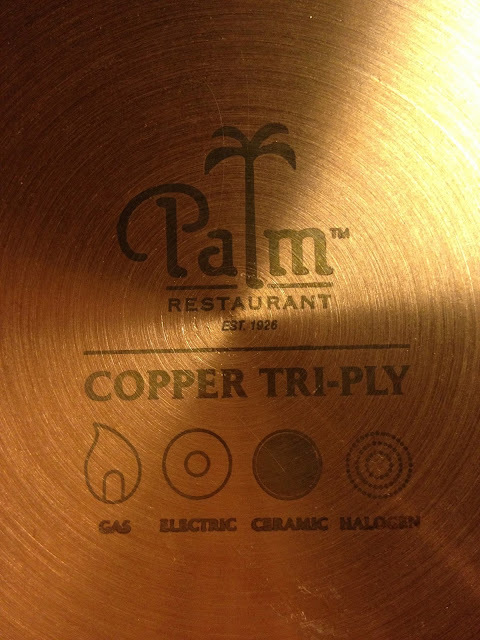 Made by Palm, they are obviously not the same quality as Mauviel copper, but I don't care. The largest pot was priced at $49, the small sauté pan at $29, and the price for the others was in-between. I'm enjoying their beauty for now atop the stove, along with all the other cooking utensils and accoutrements. In due time, they will be broken in and well loved. Don't you think it looks like a serious cook lives here? Love 'em! You have inspired me to stop by HomeGoods soon! I like that they are two tone.. I have some old copper pans that were my grandmothers and they are copper and brass and somehow (though I try) they don't look right with all the stainless in my kitchen... what can I do to make them go?? I sound silly just typing that! An awesome find...I love some copper and some Home Goods! ;o) I wanted to leave you a note to see if you had seen this blog post @ http://thepolohouse.blogspot.com? I know how you love tartan, and it is filled w/ awesomeness! Delores, I love your copper pots! What a great find! HomeGoods always has such great treasures. I have my copper pots hanging on the pot rack above the stove. I'm too chicken to use them! Lol! I do think it looks like a place for a serious cook and the copper ware is beautiful. But, does it stay this pretty after using? Oh I so want copper pots for my new kitchen. We have Home Sense here in Canada which i think is the same as Home Goods. I've noticed the copper pots being so reasonable there, but they don't always have a full set. I'm guessing my family would expect me to cook with them too. They're almost too pretty to use. Love the pots and the cute pig dish. Don't know if you've seen them, but several of their last posts have featured stunning Tartan. How fun! They look wonderful! Yours look lovely, all coordinated (as a full-set). For cleaning, all you have to do is use a lot of elbow grease with Ajax. 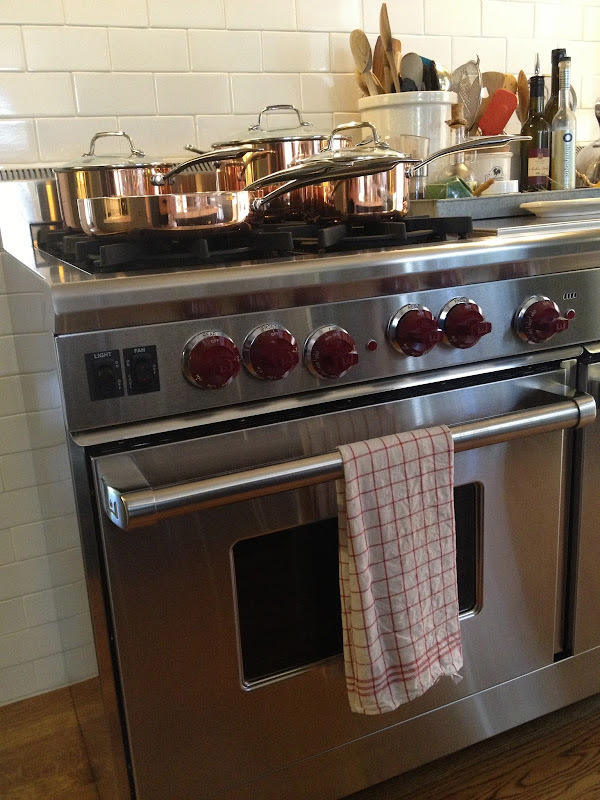 Oh, how beautiful copper looks so well on any stove! I've cooked only with copper since my teens (foodie French & Mexican family); now in my ahem; mid-40's can undeniably offer a few tips. 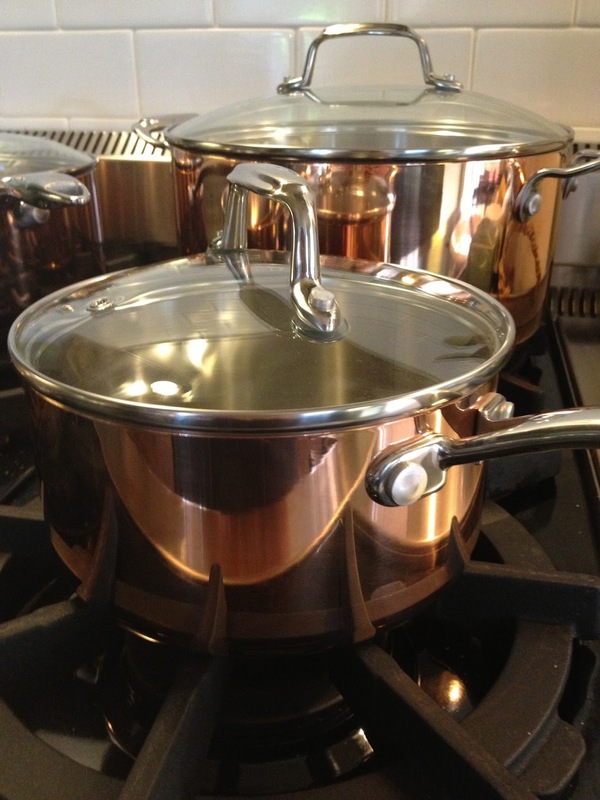 - the quality of copper cookware lies primarily in the thickness of the sides. Anything under 2mm ... it just's regular cookware. DOn't bother if they're 1mm. Mine are 3.5mm. - tin-lined is great, however after time, does need re-plating. The new stainless interior works well with the ticker side cookware. - NEVER use harsh cleaners! They're not only toxic, will damage some countertops, but will also scratch your beauties. I use fresh lemon juice (the 1/2s from making lemonade)and a non-scratch sponge, but really get them to the brand-new look infrequently. I have never commented prior to now so first let me say I enjoy your posts tremendously and your home is lovely! I also added to my copper cookware collection via a score at Homegoods- don't remember the brand but it wasn't a familiar one. I know I'm being sentimental here but ..., my collection started because I kept one of my dear Mother's pots which wasn't copper but had an interesting shape and it was hammered. I later found a Ruffoni copper pot with that shape and was also hammered and gorgeous. Hubby bought it for me and thus my first copper pot!Now, if I would just find the pot hanger that what I'm looking for. Sorry to ramble- enjoy yours as it is so nice in that pretty kitchen!! They look great! I need to head to Home Goods! Love your pig plate! Beautiful, I would hate to use them, but that defeats the purpose, right? Looks like a chefs kitchen, love the copper. i would prefer this picture above in terms of home furniture designing. i really like the furniture above it seems that's was fit color to my home office.